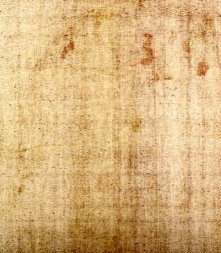 Carbon 14 tests did not prove that the Turin Shroud was medieval. A Bioplastic Coating, formed by living, growing micro-organisms did not cause errors in C14 tests. The Fire in 1532 did not alter the C14 to C12 isotope ratios or introduce additional new carbon. A Second Face image has been discovered on the reverse side of the cloth. It is not a painting. Walter McCrone did not prove that Shroud was painted and Bishop Pierre d'Arcis' (1389) claim that an artist confessed is false. The Images are contained within a very thin coating of starch fractions and saccharides. The History of the Shroud of Turin does not just begin in Europe in 1357. Bloodstains on Shroud of Turin are real blood. Coin Images of 1st century Roman lepta may or may not have been identified over the eyes. Negative Images. The picture on the Shroud of Turin is a realistic, photographic-like negative image. Vanillin is a clue to the age of the Shroud ... etc. Much of the scientific material on this site is based on the work of Ray Rogers. Rogers, a chemist, is a science Fellow of the University of California, Los Alamos National Laboratory and a charter member of the Coalition for Excellence in Science Education. He has published many scientific papers in peer-reviewed journals and U.S. Government publications. In 1978, together with several other scientists, he was invited to personally examine the Shroud of Turin in Italy for several days. He collected numerous measurements and samples of fibers and particulate materials for further study. Rogers died March 8, 2005..
NOW WE KNOW: The Carbon 14 Sample was Invalid; thus the tests in 1988 were invalid. This is reported in the peer-reviewed scientific journal Thermochimica Acta See: Volume 425 pp. 189-194). It is a must read: The Shroud of Turin for Journalists: Where Have All the Skeptics Gone?